Today we've had rain for the first time in probably a couple of months...spring has been puny this year for lack of water. 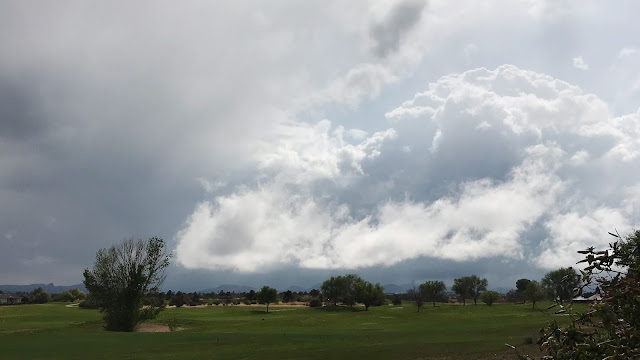 Rainy day clouds always take my breath away here in Arizona. To quote my Papa, "Arizona is seventy-five percent sky." Our sky here stretches like a grand tapestry from horizon to horizon, and the sun seems closer than other places. In the summer, monsoon storms chase across the mountains and cumulonimbus clouds tower over the earth like titans of old. My favorite cloud-scapes are like the one pictured above--where the cloud floor parts and you see the tops all gilded with sunshine and almost lost in the brilliance. (The photo can't do it justice.) It always seems like a scene from a storybook...I can easily lose myself in imagining other worlds and their stories on days like that.